You can import Eclipse projects as modules into an existing Sonargraph project or while creating a new system. To import Eclipse projects as modules directly into an already existing Sonargraph project use "File" → "New" → "Module" → "Java Modules from Eclipse Workspace" . Select the location of the Eclipse workspace you want to import projects from. 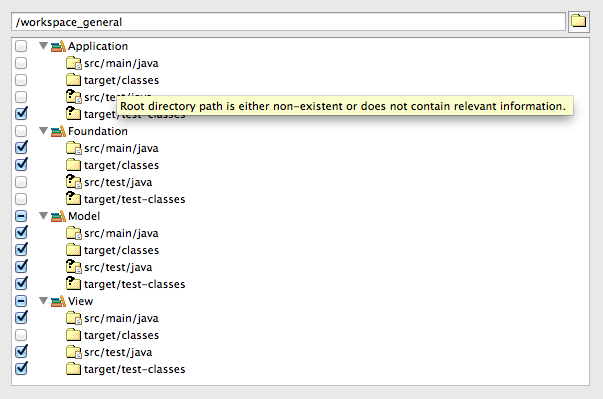 You can choose those projects and root directory paths that should be imported and those that should not. The imported Eclipse projects become modules in the Sonargraph workspace. Sonargraph will let you know about content that is already in the software system , empty or irrelevant directory paths and dependencies between modules.